The editorial (news) and advertising deadline for the July 4 issue of the Grant County Express will be 3 p.m. on Wednesday, June 29. The advertising and editorial (news) deadlines for the July 8 issue of the News will be 4 p.m. on Friday, July 1. The News office will be closed on Monday, July 4. 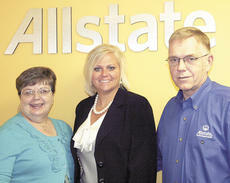 Dave Worthington is stepping down as agency owner/manager of Grant County’s Allstate office, but he’s leaving the agency he started in the “good” hands of his daughter, Christa Worthington Ruber. Grant County escaped much of the brunt of a workforce reduction plan unanimously approved June 22 by the Northern Kentucky Health Department. A total of 26 full-time equivalent positions are included in the layoff plan with 14 positions currently vacant and two positions being reduced from full-time to part-time status. Eleven people will be receiving layoff notices, said Dr. Lynne Saddler, district director of health. The Crittenden City Council has taken care of some major business matters for their 2011-2012 fiscal year. At their regular meeting on June 5, council and new Fire Chief Lee Burton agreed to a contract for the Crittenden and Community Volunteer Fire Department and council met on June 9 for the second reading of the budget for the new fiscal year. At least two Grant County residents are included in an outbreak of Shigella in Northern Kentucky. Shigella is a bacteria that infects the bowels and causes the illness Shigellosis, which most often occurs in young children. Eighty-seven cases of Shigellosis have been confirmed in Northern Kentucky as of June 17, according to the Northern Kentucky Health Department. In Northern Kentucky, an average of 25 cases of Shigellosis are reported in a typical year. A five-mile stretch of Interstate 75 in Grant County is one of 19 emergency maintenance projects Gov. Steve Beshear has authorized for repairs after being damaged by severe weather last winter. The repairs will be made on northbound I-75 between the 161 to 166 mile markers north of Dry Ridge to the Grant County line. Kentucky Transportation Cabinet officials anticipate the project will be awarded to a contractor in July with an anticipated start date of late July or early August. 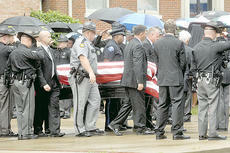 RICHMOND — One church couldn’t hold the hundreds of friends, family and law enforcement officers who joined together Wednesday to say farewell to Dry Ridge resident and former police officer Brett Benton. Total Care Pharmacy in Dry Ridge was robbed last week. According to police, a white male walked into the pharmacy at 4:20 p.m. on June 15 and demanded drugs. The suspect was approximately 5 feet 5 inches tall to 5 feet, 8 inches tall, weighing around 170 pounds. He was wearing a blue hooded sweatshirt and a scarf covered his face. “He walked in and displayed a note demanding narcotics,” said Trooper David Jones, public information officer with the Kentucky State Police Pose 6 in Dry Ridge. Williamstown Mayor Rick Skinner believes the city is in good financial shape. “Because of our utilities, we are able to be in good condition, but did have to make some budget cuts,” Skinner said. “Our goal was to have less than last year, but increasing costs, such as employee health insurance, caused it to go up,” he added. The city council began working on the budget a couple of months ago. The budget includes $1.465 million in the general fund, which represents about 1 percent more than last year.